If you have a lot of money invested in your bicycles, and maybe have one for each condition, whether trail riding or street riding etc, then storing them while not in use can be tricky. Not all of them are sturdy or user friendly. You can get all kinds of racks and hooks, but I came across this Saris Cycle Glide and thought it was the ultimate in easy user friendly storage.. Your bikes can be different sizes as the hooks adjust to the different sized wheel bases. It reminds me of a filing cabinet on the ceiling. You place your wheel base into the hooks, and you can slide the other bikes out of the way smoothly while getting one out for the day or storing one for the end of the day. This gets them off the ground, off the walls, and out of corners. 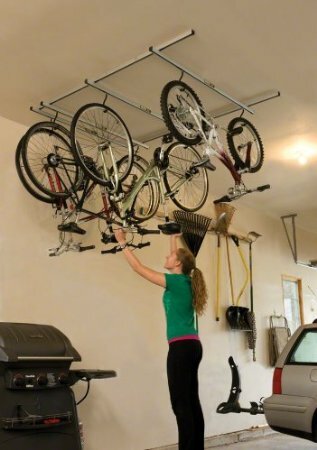 There are many bike racks on the market, that will store them, but what I really like about this one is that it uses the ceiling. As long as you can screw this into joists it will hold up to four bikes up to 50 pounds each. You can get "add-ons" to create even more space. The ceiling space is basically your ultimate storage space. You can pick and choose your cycle by sliding the others along. Check out the video below to see just how it works. I love this video. You can see just how user friendly this system is. You can have a huge investment in your bicycles, so you want to take care of them. This is perfect for either the family with all different sized bikes that you want off the ground especially in the off seasons, or for the enthusiast who has a lot invested in top of the line gear. Downside of Storing Upside Down - Either way getting them off the floor, is the best way to store them. Just make sure there is nothing that will fall off them such as water bottles or anything else that is loose. That is the only downfall to storing them upside down. You don't want anything falling on your head. But once you get into the habit of lifting them off the ground and onto the hooks at the end of your ride, you garage floor will be clear. Upside is Safe Easy Access Storage - If you are trying to find more space in your garage, then using the ceiling is a great way to utilize the space. The ceiling is your limit. As long as you can screw the framework into joists, then you can keep adding more sliders. This company has been around since 1973 in the Bicycle storage systems. This in my opinion is the best solution for high end cycles and user friendly storage systems, that keep them safe, and dry. (we used to store ours outside under a tarp, but dampness still gets in). Storing for off season as well as in season, makes this the best and easiest storage solution for your bikes. You can purchase this Saris Cycle Glide online. You can click on the pictures to find out more information, but if you have been trying to figure out a great way to get those bikes off the ground, off the walls, out of the damp sheds, out of corners, and out of the basement, then check this system out.